The judges recommended this go to InnovAero Pty Limited of O’Connor, WA, for developing the BigEye aerial camera system. BigEye is the world’s best-in-class aerial camera system which when used in conjunction with the bespoke processing technology developed by sister company Spookfish Limited provides: Industry-leading resolution/altitude performance - less than 5cm pixel size captured from 10,000ft; Industry-leading accuracy with much better than 20cm RMS location accuracy for features on the ground straight from the processed imagery without the requirement for external adjustment; Industry-leading capture rate with up to 2,500sqkm per day per system at that resolution and accuracy. InnovAero has achieved export sales already worth some $30 million and its partner company, Spookfish, has been acquired by a US aerial surveillance specialist for $140 million. The judges recommended this go to Defence Innovations Pty Limited of Mulgrave, VIC, for developing the wireless Non-Intrusive-Flight-Test-Instrumentation (NIFTI). This represents a breakthrough and quantum leap in flight test instrumentation because it is lighter, cheaper and quicker to install and remove than a conventional flight test instrumentation package. Ordered by the RAAF and proven in supersonic flight testing, NIFTI uses stick-on sensors that communicate with an on-board Data Acquisition gateway using WiFi. It is possible to instrument a supersonic aircraft with a NIFTI package in a matter of hours (instead of weeks), and then remove the NIFTI installation in less than an hour to return the aircraft to frontline service. Its domestic and export market potential are both significant. The judges have recommended this go to CryoClock Pty Limited of Adelaide, SA, for developing the “Sapphire Clock” product range. This award-winning technology provides signals that are up to 1,000 times more precise than any other commercial system: it is so precise, it gains or loses only one second over 40 million years. The Sapphire Clock has been incorporated into the Jindalee Operational Radar Network (JORN), whose upgrade aims to improve its ability to detect slow moving objects among significant background clutter, enabling JORN to see smaller objects, travelling slower, at much greater range. The impact of the Sapphire Clock in improving end-to-end radar sensitivity and resolution is such that it has been likened by Defence to “jumping the project forward by 20 years in just one day”. The judges recommended this Scholarship be awarded to Mr Graham Bell of Monash University and the co-founder and CEO of NextAero Pty Limited, Melbourne, VIC, for his ground-breaking work using 3-D printing to create an Aerospike rocket motor nozzle that has the potential to reduce the cost of space launch by up to 25%. The Aerospike nozzle essentially turns the traditional bell-mouth rocket motor nozzle inside out and provides greater efficiency, especially at lower speeds, but requires highly complex internal cooling channels to prevent overheating. Mr Bell and NextAero with resources from Monash University have employed 3-D printing technology to create the extremely complex internal shape required for an aerospike nozzle and have successfully tested it in Australia. The judges recommended this Scholarship be awarded to Mr Jimmy Toton of RMIT University, the DMTC Limited and Sutton Tools, all Melbourne-based, for his work employing 3-D Printing in the fabrication of cutting tools for very hard materials such as Titanium and Stainless Steel. Utilising 3-D printing technology will allow for significant productivity increases by producing complex and specialised cutting tool geometries that aren’t possible through traditional production processes, with optimised materials and internal cooling channels, while achieving superior performance outcomes. The aim is to increase the productivity of cutting tools used by Australian companies to manufacture high-technology components for aircraft such as the F-35 Joint Strike Fighter, reduce the cost of creating components in Titanium and Stainless Steel and so increase Australian industry’s global competitiveness. 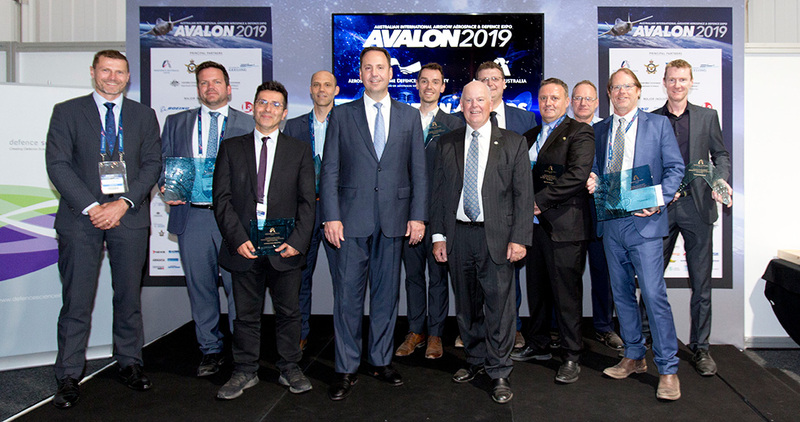 The judges recommended this be awarded to Inovor Technologies Pty Limited, of Adelaide, SA for developing a novel nanosatellite platform and a unique Space Situational Awareness (SSA) application. The nanosatellite platform consists of all subsystems required to support a payload in space, including the primary structure, the power system, pointing control, mission control and health monitoring systems. All are manufactured in Australia. The SSA mission, Project Hyperion, is a constellation of nanosatellites operating in Low Earth Orbit (LEO), looking away from Earth to monitor the high value Geostationary Earth Orbit (GEO) and Medium Earth Orbit (MEO). A unique machine learning based SSA detection and tracking algorithm enables high precision SSA by a small, low cost satellite. This enables a highly sought-after capability – the ability to persistently track a rogue or even potentially hostile GEO or MEO object of interest. Currently there is no system capable of doing this. The judges recommended this be awarded to Toll Helicopters of Bankstown, NSW, for creating the Aeromedical Crewing Excellence, or The ACE Training Centre, a purpose-built training centre that offers world class training facilities and highly realistic mission simulation technology with a focus on technical and non-technical skills for helicopter pilots, aircrew and specialist personnel, such as air medical teams. Training facilities include a Full Motion Fight Simulator, Complete Aircrew Training System, a HUET simulator and wet and dry winch simulators. The training delivered to Toll aircrews, NSW Ambulance and ACT Ambulance medical crews, as well as operational and clinical crews from other Australian States, sets a new benchmark in the domestic market and follows international best practise by utilising the most modern training programs, techniques and the latest simulation technology.